FORT WALTON BEACH, FLA. (Feb. 15, 2010) — Lisa H. of Denver, Colo., is only going to spend $5 on her husband's anniversary present this year because she won the latest ResortQuest Vacation Treasure Hunt contest Tuesday, Feb. 9. Lisa won a five-night stay for $1 a day at the Torian Plum Creekside Resort, one of the premier ski-in/ski-out properties in Steamboat Springs, Colo. The vacation at the gold-rated two-bedroom, three-bath condo is valued at $5,500. "I am from Denver and am somewhat familiar with the local resorts," said Lisa. "I decided to study all the ResortQuest Web sites so I could learn what each resort had to offer, and familiarize myself with the resort properties located outside Colorado. I started studying the sites when I didn't get the "catch-em‚ clue from a couple weeks ago that would have been a big clue!" Lisa says the timing of her five-day ski vacation couldn't have been better, as it is just a couple of weeks before her third wedding anniversary. "I love scavenger hunts and have been trying for the last three weeks to win this one," she said. "For me, this contest was more for the adventure than the prize. but now that I won, I am very excited about the trip!" Tuesday's contest was the fourth of 11 weekly promotions featuring a different ResortQuest vacation rental property,a condo, vacation home or hotel suite, at a ski destination in Aspen, Breckenridge/Keystone or Steamboat Springs, Colo.; Park City, Utah, or Sun Valley, Idaho. Torian Plum Creekside Resort‚s #316 features two bedrooms and three baths, and sleeps six. The ski-in/ski-out condo is close to a six-person chairlift and just 100 yards from the Steamboat Ski Resort Gondola. The condominium is located near exclusive shops and restaurants, including Café Diva and Saketumi, as well as the popular après-ski scene at Slopeside Bar. ResortQuest offers on-call shuttle service at Torian Plum Creekside from 7 a.m. to 11 p.m. daily during ski season. The Treasure Hunt is held every week until March 30.The next contest starts Tuesday, Feb. 16, at noon EST. To participate, treasure hunters navigate through ResortQuest's ski-destination Web sites to locate a hidden treasure map icon. The treasure map reveals the toll-free number and promotion code needed to call and claim the prize. The Web site offers clues to help treasure hunters find the location of the map. New clues are continually added until someone finds the map and calls to claim the treasure. 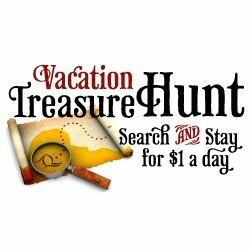 To learn more about contest rules and how to participate in ResortQuest's Vacation Treasure Hunt, visit www.VacationTreasureHunt.